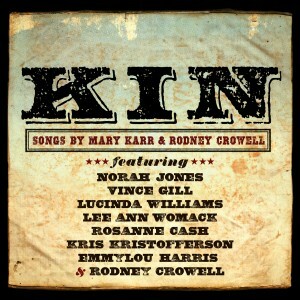 Grammy-Award winning songwriter Rodney Crowell and New York Times best-selling author Mary Karr have announced a collaborative album, Kin, Songs By Mary Karr and Rodney Crowell, which is due June 5, 2012 on Vanguard Records. Joe Henry produced the album, and Norah Jones, Vince Gill, Lucinda Williams, Lee Ann Womack, Rosanne Cash, Chely Wright, Kris Kristofferson and Emmylou Harris all contribute vocals. Upon meeting, the two quickly realized a strong connection between one another and decided to “settle down and raise a record,” as Crowell has simply put it.